So last week I attended Daystar’s Singles Fellowship All-night and it was amazing. When you start an all-night with comedy then you know you know you’re in for a great time. That same day was black Friday and I happened to be at Shoprite that day and I was surprised by the amount of crowd I saw that day. Anyway back to my original jist, during the course of the vigil, we saw a movie titled “Do you believe?” At first, when I saw the title, I was like what type of movie would this be, that has this type of name? I never knew it would end up being the most incredible movie I have ever seen. This movie will shake you to your roots; no matter the level of spirituality you are. It will force you to rethink your belief and ask yourself what exactly you’ve done with your faith. As Christians it’s important to know that; every event that happens in our lives, happens for a reason, the people you meet, the places we go, everything; if we trust God. God is the master strategist. For example, in the movie; a childless Couple comes in contact with a homeless pregnant teenager, the Husband wants to take her in but his wife refuses, so he lodges the teenager in a motel. The wife after listening to a message, went to the motel, apologized to the teenager and brought her into their home. Who would have thought that the teenager would birth the couple’s child? Now here’s what happened, the teenager died in the process of giving birth, and handed her baby to this childless couple. God brought the teenager the way of the couple, so they could have a child and the teenager could have a home. Or the case of a single mum who came in contact with a grieving elderly couple; who were still mourning the loss of their daughter. By giving a room to the single mum and her daughter, the elderly couple is able to have the feel of a child again and the single mum and her daughter have a home. You see this movie teaches and further confirms one truth, I have always believed in, true Christianity is in reaching out to the less privileged, housing the homeless, feeding the hungry; that’s true Christianity. Until you take care of someone’s physical needs, you won’t be able to effectively minister to their spiritual needs. In fact, the fastest way for a hungry man to believe that Jesus loves him is by giving him food. The single mum did not believe in Christ because she felt that if God truly existed and loved her she wouldn’t have to go through difficulties. But when a dying man leaves his home for her, it was then she came to believe in God. This man eventually died, but you wouldn’t believe he came back to life. The single mum’s daughter had earlier said she was praying for him. I strongly believe that if he hadn’t helped them, he wouldn’t have come back to life. The little girl he helped was praying for him, and the angel of a little child is constantly beholding the face of God. Another lesson this movie taught me is; the easiest way out of depression is in “Helping Others”. In the movie, there was a war veteran who just rounded up his deployment, but came up with deep-seated post-war depression. He was a troubled soul and was going to take his own life when he along with other brave men were able to save several accident victims because he was able to save people his life experienced a turnaround. Love is a very powerful force that can transform even the darkest of lives. A lady in the movie was alone and lonely, she had no family that cared for her. The father who was supposed to be there for her couldn’t be bothered about her. She was about taking her life when she met a man. He was also broken just like her, but in the course of their friendship, she found a reason to live again. The funny part was how they met, they both met when they were both about committing suicide. Guess what, it was the war veteran. What does the Cross of Christ mean to you? The Cross of Christ would demand from you, and if you truly believe in the Cross, you would do something about it. This was another lesson I learned from the movie. I went home and kept asking myself, what the Cross of Christ means to me. The Cross of Christ reminds me of the sacrifices that Christ paid and His blood that was shed. If Christ paid a price then it means, the Cross would demand something from me too. It could be what I love most, it could be to show God the extent I could go to prove my belief, or it could mean I must preach to others about the cross. Whatever it is, be ready to take up your cross and follow. This journey is not for the faint-hearted, the cross would demand from you, and you must be ready to pay when the times comes. This came into play, when a fireman in the movie was charged to court; because he led a dying man to Christ. The man’s wife who he led to Christ sued him to court, saying he forced his religion on her husband and was not concerned about his physical health. His boss told him that he should apologize to the woman, saying he made a mistake and the case would be dropped and the office would represent him. But he refused to do that, you see doing that means he’s ashamed of the gospel. He recognized his cross and was ready to carry it. He stood the risk of losing everything he worked for, his wife was pressuring him to just apologize so he wouldn’t have to lose his job, but he refused. Of course, he lost in court, but guess what; the lawyer who took him to court was won for Christ. Now here’s what happened, the lawyer was involved in an accident and was going to be burnt, if not for the timely intervention of this fireman. She had to ask him why he rescued her and he told her, “Love Your Enemies”. This Christian race is not an easy race, this was a lawyer that was bent on destroying him, simply because he’s a Christian, yet he risked his life to save her. Lastly, my most remarkable character in the movie was a black guy who gave his life for his brother. His brother was about to be shot and he knew if his brother died he would end up in hell so he took the bullets that were meant for his brother. At that scene, I literally cried; it was unbelievable. But you see Christianity is Love in action. If you can, please see this movie, this is the most spiritual incredible movie I have ever seen. 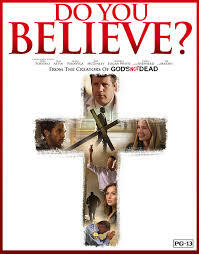 It will keep you at the edge of your seat and when you are done, you would ask yourself, “Do I believe? If you’ve seen the movie, kindly let us know your thoughts about it in the comment section and even if you haven’t seen the movie; I love to hear from you always, do leave a line or two. God bless you.